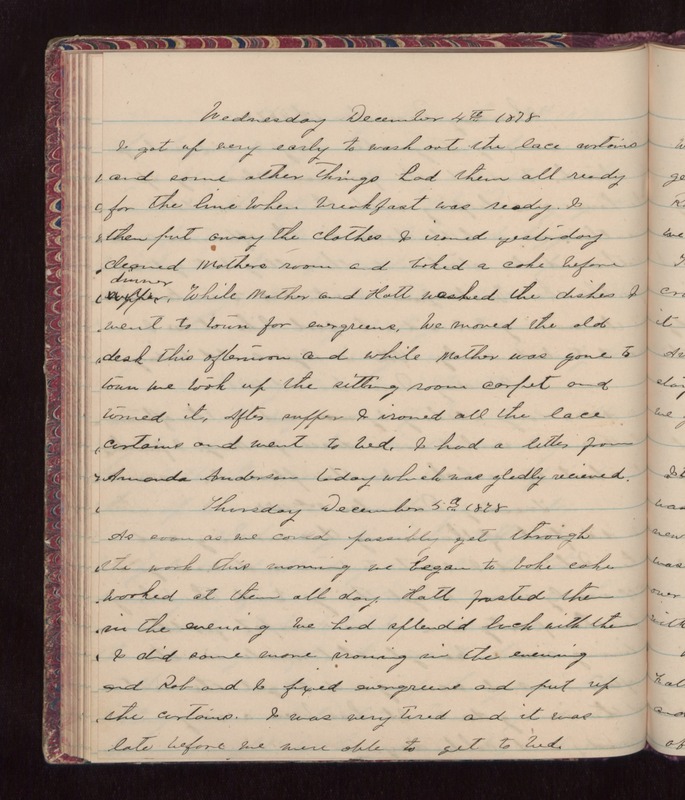 Wednesday December 4th 1878 I got up very early to wash out the lace curtains and some other things had them all ready for the line when breakfast was ready. I then put away the clothes I ironed yesterday cleaned Mothers room and baked a cake before dinner. While Mother and Hatt washed the dishes I went to town for evergreens. We moved the old desk this afternoon and while Mother was gone to town we took up the sitting room carpet and turned it. After supper I ironed all the lace curtains and went to bed. I had a letter from Amanda Anderson today which was gladly recieved. Thursday December 5th 1878 As soon as we could possibly get through the work this morning we began to bake cake worked at them all day. Hatt frosted them in the evening We had splendid luck with them I did some more ironing in the evening and Rob and I fixed evergreens and put up the curtains. I was very tired and it was late before we were able to get to bed.